The Federal Housing Finance Agency (FHFA) is celebrating the completion of more than 3 million foreclosure prevention actions by Freddie Mac and Fannie Mae since the two government sponsored enterprises (GSEs) were placed in conservatorship. Helping families avoid foreclosure through loan modification and other programs has been a priority of the agency and is one of the key goals of FHFA's Strategic Plan for the two companies. Foreclosure prevention is generally categorized as either home retention actions which include loan modifications, forbearance plans and repayment plans and or as foreclosure alternatives where homeowners are assisted to exit homeownership without foreclosure, usually through a short sale or a deed in lieu. "Three million completed foreclosure prevention actions is a significant achievement," said FHFA Acting Director Edward J. DeMarco. "It represents real assistance to homeowners, improved stability for their communities, and has produced meaningful savings for taxpayers. I am grateful for the persistent effort of everyone at FHFA, Fannie Mae, and Freddie Mac, who have contributed to reaching this milestone." The three million foreclosure prevention actions since September 2008 included 1.024 million trial modifications started through the Home Affordable Modification Program (HAMP) which resulted in 601,542 permanent modifications of which 431,852 are still active. Permanent modifications that were done outside of HAMP total 748,542. In addition the GSEs have put into place 736,033 repayment plans, 157,961 forbearance plans, and 9,717 charge-offs in lieu. Home forfeiture actions have resulted in 482,363 short sales and 49,383 deeds-in-lieu. Even though the housing crisis appears to be winding down, the two GSEs completed 74,879 home retention actions in the third quarter of 2013, 57,878 of which were loan modifications. This is down from the 87,675 home retention actions and 59,635 modifications in the second quarter. The companies completed 21,803 short sales (compared to 24,656 in the previous quarter) and 4,194 deeds in lieu (down from 4,757). Delinquencies in the GSE portfolios continue to drop, with loans 30 to 59 days past due falling from 513,000 in the second quarter to 460,000 in the third. 60 day plus loans fell from 915,000 to 852,000 and seriously delinquent loans from 783,000 to 724,000. 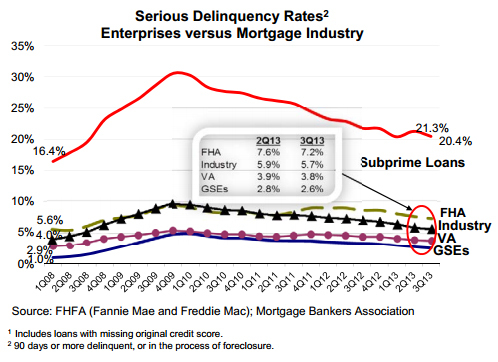 The thirty-day delinquency rate was down from 1.83 percent to 1.64 percent and the serious delinquency rate from 2.78 percent to 2.56 percent. There were 117,000 foreclosure starts in the third quarter compared to 125,000 in the second and the number of housing units in the REO inventory increased slightly to 148,000 from 142,000. 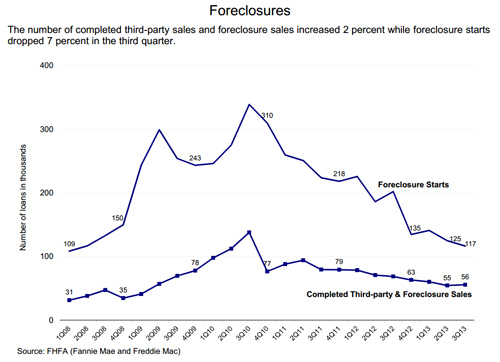 The number of third party and foreclosure sales increased by 1,000 to 56,000. The more than 3 million foreclosure prevention actions completed since the start of the conservatorships have helped roughly 2.5 million borrowers stay in their homes through loan modifications and other actions. In addition, over 500,000 borrowers avoided foreclosure through short sales or deeds-in-lieu. 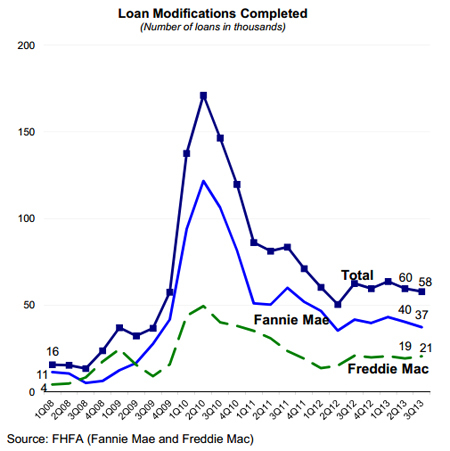 In addition to the foreclosure prevention actions, Fannie Mae and Freddie Mac have completed more than 18 million refinances since April 2009 including more than 2.9 million through the Home Affordable Refinance Program.